Rain Bird has introduced a new Sod Cup Kit that reduces the risk of rotors negatively impacting play on closely mowed approaches. The kit helps reduce the time it takes to trim around rotors, freeing greenkeepers to work on other tasks. Installing the kit on Rain Bird 551 and 700/751 Series rotors is a simple process that can be done by hand with no tools required. 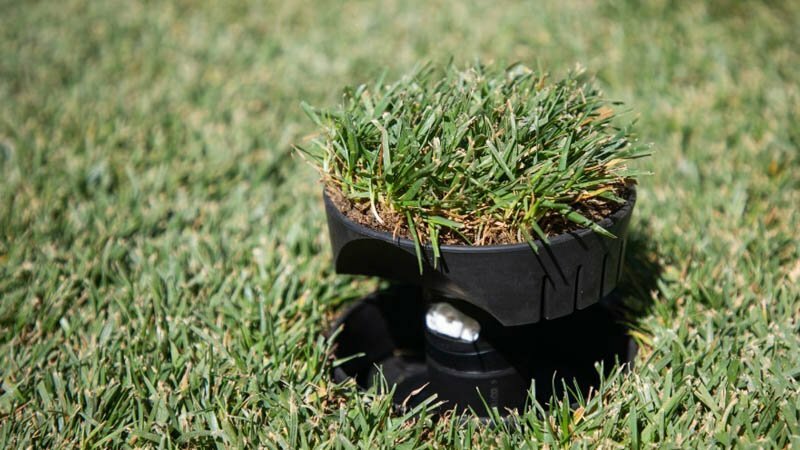 Because the sod cup is the same size as a standard golf-hole cutter, it's easy to quickly cut sod that's just the right size and shape to fit firmly and securely within the cup. After installation, when the rotor is popping up or retracting, its self-flushing action sends a burst of water through the case. This flushing action simultaneously protects the rotor's internal components from debris and irrigates the turf now growing in the sod cup. SiteOne Landscape Supply launched a mobile-friendly e-commerce web site that allows customers to place orders from anywhere at any time. After users establish an online account they will be able to place orders, manage their account and access all of new features. Customers can search product availability, get access to specific pricing and place orders for pickup or delivery for products such as fertilizers, pesticides, irrigation supplies and tools and equipment. In addition to the site's enhanced e-commerce abilities, SiteOne.com provides resources such as video tutorials, business tips, category-specific articles, green industry event information and more. PBI-Gordon Corp., which manufactures consumer and professional turf and landscape products, has moved into its new corporate headquarters in Shawnee, Kansas. PBI-Gordon bought the building in March. Since then, the 95,000-square-foot office building has been renovated to accommodate approximately 100 of the company's employee owners. The company employs more than 400 in facilities in Kansas, Missouri, Illinois and Florida. PBI-Gordon has been based in the Kansas City area since its founding in 1947. The company recently moved from its former headquarters in Kansas City, where it had been since 1981. All local research or manufacturing will continue to be be conducted at the company's locations in Kansas City, Kansas and Kansas City, Missouri facilities.